The vast majority of all shots are missed when "English" or sidespin is used. The reason is simple: when you use English, the cue ball doesn't go where you aim it. That's called "cue ball deflection" or "cue ball error" and the typical player takes years to learn to compensate for it. The amount of cue ball deflection depends on the cue used, the tip placement and the speed of the stroke. The farther the strike from center, the more the cue ball is deflected off-line. Cue ball deflection will also increase with a faster stroke. Lower deflecting cues require less compensation and therefore make the game easier. The Predator shafts are designed to reduce cue ball deflection and are the lowest deflecting shafts on the market. They greatly increase your chances of making your shot when you use English. With any shaft, there is an optimal point on the shaft, called the pivot point, where you need to bridge to maximize your accuracy. In simple terms, if you bridge at the correct pivot point for your shaft and your initial set-up alignment is on target, you can actually hit the cue ball off-center and still hit the 1-ball dead center. At that bridge length, the deflection, or squirt, produced by the shaft will compensate for a stroke that deviated from its original set up or alignment. The optimal pivot point on the break is the bridge length that allows you to maximize your speed and gain maximum forgiveness at the same time. The BK2's pivot point has been tuned between 13" and 14" to allow you to maximize both acceleration and forgiveness at the same time. A majority of strong breakers bridge between 13" and 14" because it allows them greater acceleration and more powerful breaks. 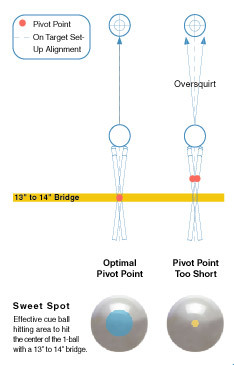 Most break cues have pivot points between 9" and 11" and require an extremely accurate stroke when using a longer bridge to generate speed. The BK2's pivot point has been tuned between 13" and 14" to allow you to maximize both acceleration and forgiveness at the same time. With a pivot point 2" longer than its next competitor, the BK2 gives you greater speed, increased accuracy and, much more importantly, a more powerful break. Predator research has clearly shown that a dime radius (or shape of a dime) will produce 5 percent to 10 percent less cue ball deflection than the more commonly used nickel shape. The cue ball deflection is reduced because the dime radius centralizes the hit to the center, or strong part, of the shaft. The purpose of burnishing your shaft is to smooth and seal the wood. The more you burnish, the better the finish and, the slicker and more moisture resistant your shaft becomes. Moisture is the #1 enemy of your shaft. It causes the grain to raise and your shaft to warp. To burnish your shaft, use a leather burnisher and avoid abrasives. Sanding your shaft wears it down and makes the wood porous, which allows moisture to penetrate the grain and damage the wood. Do not use any abrasives on your shaft and stay away from green pads in Pool Rooms. Using abrasives is going to take the diameter of your shaft down and modify the shape of your taper. It may even void the warranty of your Predator shaft if the ferrule or wood diameter falls below 12.25mm for 314 shafts and 11.4mm for Z shafts. Very fine micro papers (1500 grit) or burnishing is about all you need. Contrary to what many believe, lighter is better when choosing a break cue weight. Even though a heavier break cue feels more powerful, a more powerful break will be achieved with a cue weighing 18.5 to 19 oz. Most professional players break with a cue that is 1/2 to 1 oz lighter than their playing cue because less weight allows them to generate more cue speed, resulting in greater cue ball speed and a more powerful break.